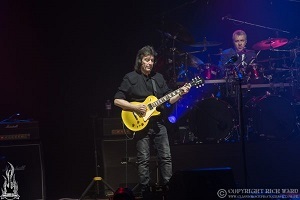 Concerts: Steve Hackett @ Symphony Hall, Birmingham � 05/01/2017 - Sea of Tranquility - The Web Destination for Progressive Music! 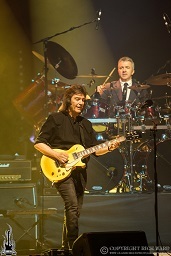 Such was the overwhelmingly positive reaction to his Genesis Revisited shows a few years back Steve Hackett must surely feel compelled to continue to delve into his previous bands history for each subsequent tour. But having stated his intention to not become a touring Genesis museum, the guitarist continues to release new and challenging material with recent album The Night Siren seeing him draw on a myriad of eclectic influences from around the world. And so the current show is divided between selections from Hackett's solo work in the first half followed by a second set in which the band are joined by enigmatic vocalist Nad Sylvan for a Genesis set that draws heavily on Wind and Wuthering, an album which has recently passed its fortieth birthday. Cameras are in evidence at Symphony Hall suggesting a live release will follow at some point in the not too distant future and the band respond with a marvellous performance that demonstrates Hackett has surrounded himself with some excellent musicians. In addition to band regulars Gary O'Toole, Roger King and Rob Townsend he is joined by brother John Hackett on the flute for 'Serpentine Song' and Amanda Lehmann on additional guitars and vocals during a full length 'Shadow of the Hierophant'. The real crowd pleaser of the bunch is the returning Nick Beggs who produces a highly animated performance, most notably when sitting cross legged and pounding his pedals during the aforementioned '..Hierophant' which brings the first half to a suitably powerful and dramatic close. 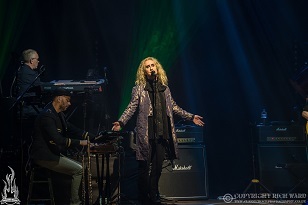 Nad Sylvan's arrival for the second half is greeted by a loud response from the audience and he continues to do a great job in recreating the 70's. Not that he is the only featured vocalist as Gary O'Toole takes his usual outstanding vocal spot on 'Blood on the Rooftops', arguably one of Genesis most underrated songs that has been given a new lease of life in recent years by Hackett and his band. With the Gabriel years only represented 'Firth of Fifth' and a suitably zany 'The Musical Box' there is a nagging sense that Sylvan is slightly under-utilised (as anyone who has witnessed him on 'Supper's Ready' will surely agree) but this was another terrific show from all concerned. And as for the man himself his guitar playing is nothing less than exemplary throughout, showcased none more so than during a blistering 'Los Endos' that closed a show that ran to more than two and a half hours.